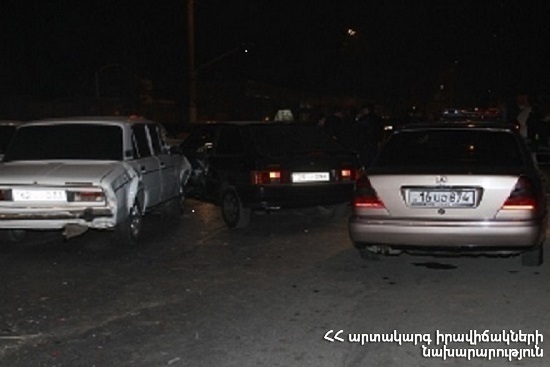 On February 13, at 23:17 an emergency call was received to “911” service that a car accident had occurred near “Yerevan City” supermarket in Erebouni street of Yerevan: there was a gas leak, the rescuers’ help was needed. It turned out that “Toyota Camry” and “Opel Astra G” cars had collided. The rescuers removed the driver of “Toyota Camry” to ambulance car, disconnected the automotive battery and closed the gas valve of “Toyota Camry”. The casualty was hospitalized to “Erebouni” medical center. According to doctors the casualty was in fair condition.